Couples looking for a beautiful start to their shared lives will find no shortage of incredible wedding venues in Chicago. Everyone has their vision of the perfect wedding, and among these 25 Chicago wedding venues, they're sure to find the right spot to host it. 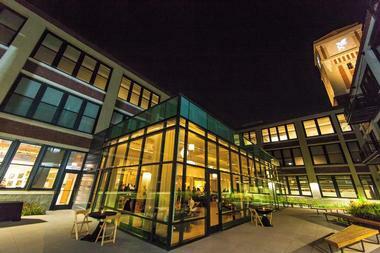 Loft on Lake is an award-winning venue offering couples urban elegance with an artistic edge. The interior provides architectural elements such as 20-foot-high ceilings, exceptional exposed brick walls, and exposed beams made of warm oak timber. The most outstanding element of this loft is the bow truss: A 65-foot-long skylight that bathes the loft in natural light by day and reflects the glow of the inside décor at night. The space itself can be completely transformed into any wedding design, whether couples are looking for an ethereal rustic ambiance or a more traditionally elegant, black-tie affair. The Zhou B Art Center, in Chicago's historic Bridgeport neighborhood, was founded in 2004 by world-renowned contemporary artists Shan Zuo and Da Huang Zhou as a place of artistic collaboration and community. The venue offers 28,000 square feet of space on two floors and can accommodate small or lavish weddings surrounded by world-class art. 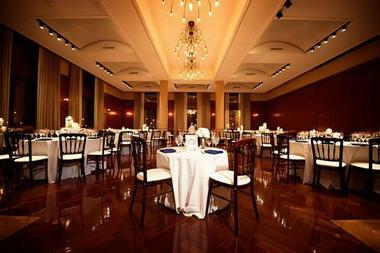 Couples looking for a sophisticated yet trendy venue have found it here. Catering at Zhou B is provided by LM Catering, who can build a custom wedding menu for a plated dinner reception or design a glamorous cocktail-style reception. They have indoor reception space for up to 500 guests and outdoor reception space for up to 250 guests. 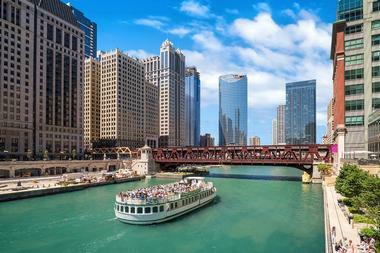 With Chicago River and Lake Michigan at hand, it is no wonder that partying on the water is a popular option for weddings, birthdays, office parties, and all other celebrations in Chicago. Chicago's First Lady Cruises make it all possible, fun, and enjoyable with their fleet of cruising vessels that can fit groups ranging from two to 250 people. The vessels are distinguished, with luxurious appointments that bring to mind the elegance of early 20th century luxury yachts. Spacious outdoor decks are made for dancing under the stars. Luxurious, climate-controlled interiors have large picture windows, opulent décor, and elegant bathrooms, the perfect setting for a great party. Chicago’s First Lady Cruises book only one group per boat, so the vessel is exclusively yours for one night. Whether you want to cruise on the Chicago River, Lake Michigan, or both, you can be sure your party will be a night that everyone will remember. The Catalyst Ranch is a one-of-a-kind historic loft venue that is both lively and eccentric in its design; this colorful space offers a fun spirit with ethnic and vintage décor. There is plenty of diverse seating interspersed throughout the venue, perfectly suited for guests to kick up their heels, then take a break between dance numbers. Located in the heart of the burgeoning West Loop area, the Catalyst Ranch is just steps away from eateries, hotels, and entertainment houses. They offer an esteemed special events team that works with each couple to create their dream wedding, including providing catering, music, floral, and photography vendors. 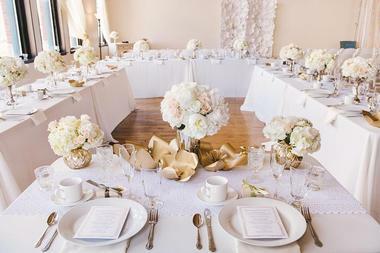 The City View Loft is an excellent venue for couples who want to custom-design their weddings. The loft features 13-foot timber ceilings and an open concept floor plan. It is surrounded by glass windows that offer picturesque views of the Chicago cityscape. With brick walls, chestnut wood tables and furnishings, and a bar area surrounding a grand dance floor, it is ideal for accommodating up to 128 guests. During the day, the space is infused with natural light and by nightfall, delicate candles and the twinkling lights of the city provide a romantic ambiance. They have experienced staff and a preferred vendor list to assist with every aspect of the wedding. 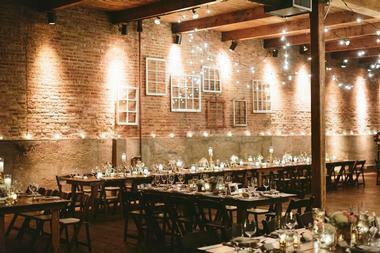 City Winery offers six distinct private wedding spaces that can be tailored to any couple's vision. Their main dining room features exposed brick, a wood-burning fireplace, and views of beautifully displayed oak barrels. The Barrel Room and Winery work best in tandem with one another, where oak barrels surround the guests as they enjoy an intimate dinner and small reception. The mezzanine accommodates wedding parties of up to 80 people in a space that offers expansive views of Chicago's skyline. Their Concert Venue is the largest, holding up to 240 people; it's a rustic space with a versatile floor plan. 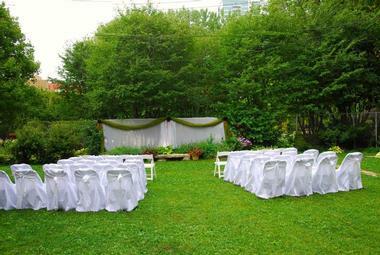 They also have an outdoor patio surrounded by lush greenery, perfect for large outdoor weddings. 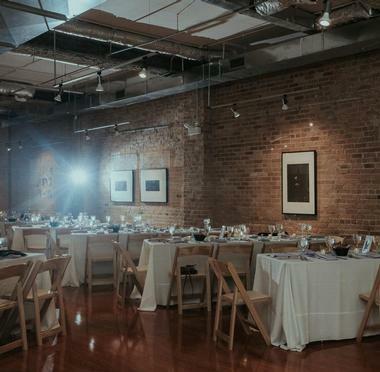 The Creativo Loft is a historic venue dating back to 1887, providing a rustic charm with warm tones, original 16-foot-high tin ceilings, and 14-foot-tall glass windows that overlook downtown Chicago's cityscape. This raw space allows for couples to design their dream wedding in an intimate setting that can accommodate up to 74 people. Each bride and groom can infuse the loft with their own personal style to perfectly blend into the Old World Italian ambiance it provides. The prime location is matched by the owner's dedication to create the best weddings possible for each couple, utilizing a premier list of vendors that handle everything from catering to entertainment. 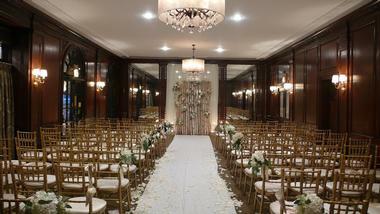 The Drake Hotel offers couples a timeless elegance with three distinct wedding venues. Among them is the Gold Coast Room; at just under 7,000-square-feet, it is almost the same size as the ballroom in Buckingham Palace and is equally impressive. This regally decorated palatial ballroom also provides stunning views of Lake Michigan. Their second space, the Grand Ballroom, was originally built in the 1920s, offering a historical feel; it's the perfect venue for a roaring good time with a live band and views of iconic Walton Street. The third space is the French Room, ideal for smaller and more intimate weddings, boasting custom furnishings and picturesque views of Lake Michigan. Firehouse Chicago was originally built for Engine Company 70 and served as an integral part of the neighborhood for over 100 years. It was restored to its former splendor, keeping the glazed brick and high ceilings, and now serves as an idyllic wedding venue for couples who want a vintage wedding. The first-floor main area of the event space can accommodate up to 100 guests. It features a classically simple setup with reclaimed wood farm tables and bars, vintage furniture, seating vignettes, and padded fruitwood folding chairs. The second floor is a vintage locker room. Firehouse Chicago also features an outdoor garden area with a wedding platform. The Four Seasons Hotel in Chicago is an ideal venue for couples who are looking to design and host a lavish and elegant wedding. 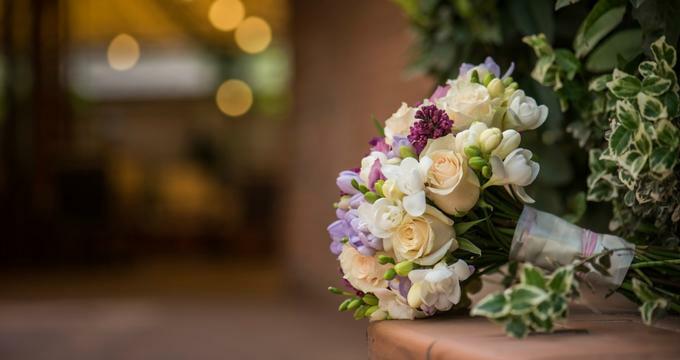 Located on notable Michigan Avenue, the Four Seasons has a prime location and the most versatile Grand Ballroom in the city, a perfect place to create a dream wedding. Couples who book the Grand Ballroom get exclusive use of the entire eighth floor, opulently decorated in warm tones and dark wood, floor-to-ceiling windows, exquisite crystal chandeliers, a baby grand piano, and various seating options. The hotel is equipped with professional event planners that work with each couple to develop their vision. Gallery 1028 is a unique, urban venue on Goose Island in Chicago, an island known for its mixture of nature and city life. Couples who want to design a vintage-style wedding with a twist will enjoy this completely raw locale. It is 6,500 square feet of transformable space and features 16-foot-high vaulted ceilings, hardwood floors, exposed brick walls, and a set of six windows on the east wall. The space can accommodate up to 250 people and can be designed in a multitude of ways, including intimate boutique, large rustic-chic, elegant black tie, or casually traditional. The Greenhouse Loft offers more than 3,600 square feet of customizable, naturally lit, and clean event space in the Logan Square neighborhood of Chicago. This premier wedding venue provides each couple with everything they need to create a memorable wedding with their dedicated team of professionals. 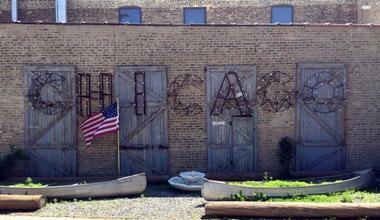 It is also the most sustainable wedding venue in Chicago, making it an ideal locale for eco-conscious couples. This one-time manufacturing facility has been completely refurbished, including hardwood floors made from 120-year-old reclaimed wood and restored mid-century furniture. It also has an 8,000-square-foot organic sky garden as well as a co-op vegetable garden. The Ivy Room at Tree Studio is a versatile venue featuring a lower-level lounge, ballroom, and courtyard, easily accommodating any size or style of wedding. This historic yet modern space provides guests with an artistic elegance utilizing warm tones, beautiful hardwood floors, soaring ceilings, and wood furnishings. Each venue at the Ivy Room can accommodate up to 180 guests. Many couples will find it ideal to have a garden wedding ceremony and hold the reception in the Grand Ballroom, which overlooks the enchanting courtyard from its floor-to-ceiling windows. The lower-level lounge is an ideal space for a pre-ceremony cocktail and hors d' oeuvres hour. The Keith House is a magnificent 1870s mansion nestled in the heart of the iconic Prairie Avenue Historic District. The mansion has three distinct rooms that can be utilized for any style of wedding: The parlor, the dining room, and the art gallery. 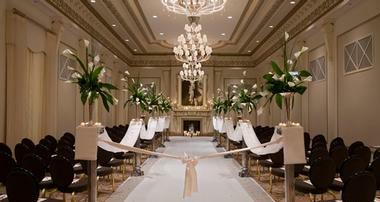 This is the ideal venue for small and intimate ceremonies of no more than 90 people in a historic and opulent ambiance. The sprawling backyard area surrounded by towering trees and lush greenery is an idyllic location for a larger outdoor ceremony. Inside, the mansion can accommodate up to 75 people for a cocktail-style reception or 50 people for a seated dinner reception. Newberry Library is an excellent venue for couples who are looking to host a traditional wedding with timeless elegance. The lobby and Ruggles Hall, the main event space, can be used for pre-wedding cocktail and hors d' oeuvres, ceremony, and reception accommodating up to 208 guests. Stunning chestnut hardwood floors, vaulted ceilings, warm cream tone walls, floor-to-ceiling windows, a baby grand piano, and ornate furnishings provide a charming interior for couples and their guests. For those who want an outdoor ceremony followed by an indoor dinner and reception, they're encouraged to host it at the Washington Square Park across from the library. The Ovation is an off-the-beaten-path venue off Fulton Street, a completely redesigned old foundry building that has been transformed into a modern industrial-chic loft space. 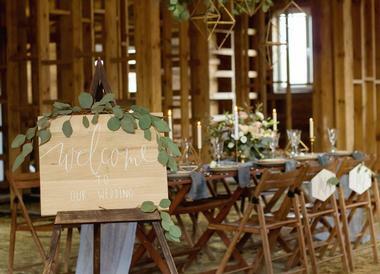 This is the perfect event space for couples who want a unique wedding experience that offers a modern rustic ambiance. Soaring wood ceilings with exposed iron beams and a large skylight bathe the loft in natural light by day, while contemporary wrought-iron chandeliers warm its interior at night. Exposed brick walls, re-purposed wood furnishings, including a permanent bar, and farm-style tables create the perfect space. Ovation also has a second-floor mezzanine, a baby grand piano, private powder rooms, and a custom photo booth. Room 1520 is an urban gem in the West Loop neighborhood of Chicago offering 4,000 square feet of versatile open space. Couples can custom-design this event venue any way they want, whether subtly enhancing its minimalist charm or creating a lavish and luxurious setting. The entrance features floor-to-ceiling windows opening onto a spacious foyer; from there, a stunning artisan staircase leads the way to the Great Room, where the celebration will take place. The Great Room showcases 11-foot-high ceilings, crystal chandeliers, and white décor in an airy space. An adjacent bridal suite includes a private mini-bar and a private powder room. Salvage One is a completely unique warehouse turned event space that boasts 60,000 square feet of exposed brick, hardwood floors, massive windows, and an eclectic array of furnishings that will make any wedding a memorable affair. This industrial-chic venue offers an indoor cocktail party and ceremony space featuring wooden church pews, sparkling chandeliers, and beautiful Greek columns. Their second floor is ideal for receptions, with vintage furnishings and two entertainment stages. Salvage One also features a courtyard perfect for outdoor ceremonies and pre-ceremony cocktail hours, and is surrounded by lush greenery, stately trees, and ivy-covered exposed-brick walls. Salvatore's Ristorante is an ideal location for couples who want a classically traditional wedding experience. 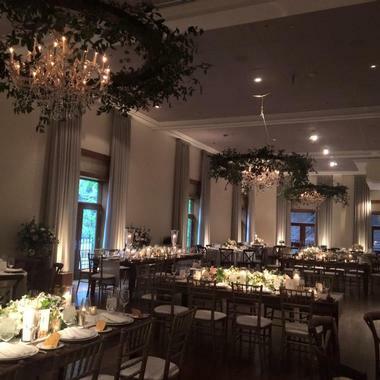 This hidden gem can be found in the upscale Lincoln Park neighborhood and is a stunning venue that features both indoor and outdoor spaces. Inside, details include mahogany walls, French windows, and magnificent sparkling chandeliers. Outside is an enchanting patio surrounded by trees and lush greenery, ideal for a ceremony with nature as the backdrop. This modern venue utilizes a simple color scheme that allows couples to transform any of the spaces into their dream design. They also provide catering and experienced staff to assist with all aspects of the wedding. 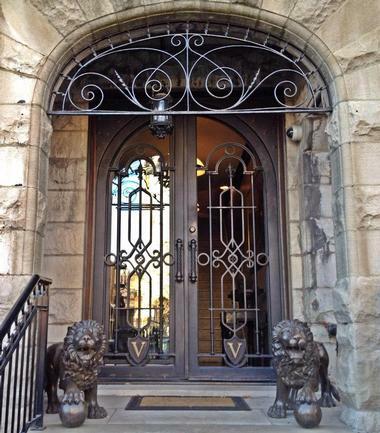 Stan Mansion is located in charming and historic Logan Square, one of the oldest neighborhoods in the city. Originally built in 1921, it served as a Masonic Temple; in 2014, it underwent a complete renovation and now serves as beautiful event space. Designed by architect Moritz F. Straugh, the mansion offers couples an unmatched traditional elegance with a grand exterior and opulent interiors. Stan Mansion offers three distinct spaces, which can be used individually or collectively for classic, small, and intimate weddings of 50 guests to large, lavish, themed weddings for up to 450 guests. 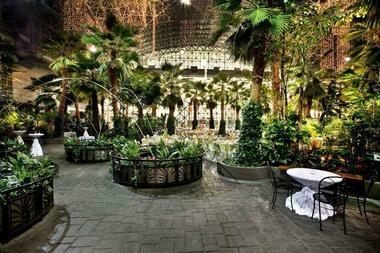 The Crystal Gardens is a majestic indoor botanical garden that sits on 1 acre at the Navy Pier in Chicago. This is the best venue for couples who are looking for a tranquil ethereal style wedding. This glass atrium is six stories high, featuring a 50-foot arched ceiling that showcases lush foliage, dancing leapfrog fountains, strings of twinkling lights, and more than 80 live palm trees. Stone pathways wind around stunning greenery displays and water fixtures, a grand dance floor, and an entertainment stage. The entire venue can be rented out to accommodate up to 1,500 guests, while partial rentals can accommodate up to 500 guests. 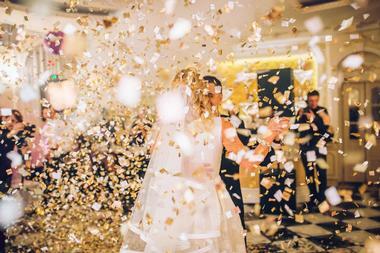 Palmer House Hilton is for the couple that dreams big and loves a good love story. Palmer House was actually a wedding gift in 1870 from Potter Palmer to his bride, Bertha Honoré. 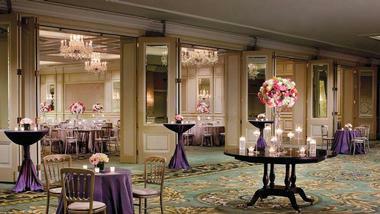 To date, the wedding venue has hosted over 9,000 weddings and is a favorite among Chicagoans. It features seven lavish ballrooms that can accommodate intimate weddings of as few as 80 guests to large affairs of over 1,000 guests. The Palmer House wedding coordinators will guide couples every step of the way, and the catering team, one of Chicago's finest, will dazzle guests with the perfect hors d' oeuvres, plated dinner, or wedding buffet. Villa D'Citta, in Chicago's fashionable Lincoln Park neighborhood, was once the summer home of a wealthy Chicago tycoon. Now, it's a romantic bed and breakfast that is the perfect venue for the sophisticated urban couple that desires an intimate yet luxurious wedding. The entire mansion can be rented for the big day, including the six guest rooms. The chic mansion is a stylish mix of Old World European elegance and modern décor and amenities. 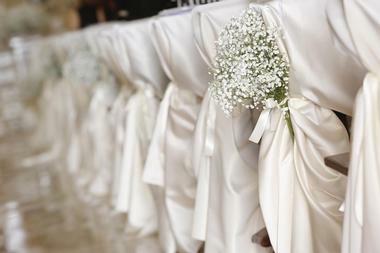 It can accommodate weddings of up to 100 guests. Couples choosing this wedding venue will need to coordinate their own vendors, including catering. Mansion event staff are happy to work with outside vendors. The Floating World Gallery is an award-winning venue and an intimate, urban oasis surrounded by beautiful masterpieces of contemporary and classic art. Floating World features brick walls, high ceilings with exposed beams and piping as well as large floor-to-ceiling windows bathing the space in light. The loft accommodates up to 200 guests, offers a preferred vendor list, provides tables and chairs, and allows couples to store their decorations and floral arrangements the night before the wedding. The gallery is a virtual blank canvas, allowing each couple to custom design their wedding, whether it is traditional, exotic, or other wedding theme. The Carnivale Restaurant is a unique venue that offers seven distinct event spaces that can accommodate wedding parties with as few as 10 guests up to 1,000 guests. These include the Salons I, II, III, Lambada Lounge, Flamenco Room, Tango Room, Catwalk, Samba Room, and Main Dining Room. The best rooms for sit-down dinners and lively receptions are the Tango Room and the Samba Room; both are located on the second floor adjacent to the Catwalk – a balcony that overlooks the Main Dining Room. They feature high ceilings, exposed beams, 70" flat-screen televisions, and private bars. In the Samba Room, couples will also find floor-to-ceiling windows that overlook Chicago's cityscape.